Ben Smith says “for me, OIB has been a great opportunity to look at all the great data that NASA has already collected in Greenland and Antarctica, and to think about it in terms of what it’s going to do for us in the future after ICESat-2 launches”. Three PSC investigators were recently awarded funds to support their participation in NASA’s IceBridge mission. They include Ron Lindsay, Ian Joughin and Ben Smith. IceBridge is conducting the most extensive set of airborne surveys of the polar ice caps and sea ice ever undertaken. These aerial surveys will allow scientists to gather data during the interim between two satellite missions dedicated to measuring the changing thickness of polar ice caps and sea ice, the first ICESat mission in started in 2009 and ICESat-2, planned for the end of 2015. As Ben Smith explains; “every time one of these flights goes up over the ice sheet it crosses, and sometimes follows, old flight tracks that go back as far as 1993. And every time that happens, we can write another little history of how that spot on the ice sheet has changed over time”. Remote sensing will include laser altimetry and radar measurements of the Greenland and Antarctic ice sheets and sea ice in the Arctic and Southern oceans. Flights began in spring 2009 and major campaigns are planned for each polar region annually. The PSC investigators will help plan flights, select instrumentation, and perform data analysis. They will also apply the resulting data to their own projects. The mission is using NASA DC-8 and P-3B aircraft fitted with the Airborne Topographic Mapper (ATM), and the Land, Vegetation, and Ice Sensor (LVIS), to collect laser altimetry data that can be compared directly to both ICESat missions. According to Ron Lindsay, IceBridge also “provides important comparison data for the European Cryosat satellite that is currently in orbit and which measures sea ice and ice cap thickness with a radar altimeter” instead of a laser altimeter. A variety of radar instruments will additionally be used to measure snow depth over sea ice, snow properties over the ice caps, and properties of the glacial beds. These data are critical in enabling a multidisciplinary team of scientists to track changes in the extent and thickness of ice between the end of the first ICESat mission and the beginning of the second. In fact, according to Ben Smith, “we learn a lot by comparing this year’s measurements to those from 2005 or 2000 or even 1995, and we’ll do the same with the 2010 measurements in 2015 when the ICESat-2 data start coming in”. It will also provide data that will improve our understanding of ice cap dynamics and the prediction of sea level rise resulting from global warming. Ron Lindsay, Ian Joughin and Ben Smith are part of a team of investigators from NASA, Columbia University, the University of Maryland, the Jet Propulsion Laboratory and the University of Kansas. Ron is an expert in sea ice observations, theory, modeling, and prediction. He has conducted Arctic climate research for over 30 years. Ian has focused on using a combination of remotely sensed data, field observations, and numerical modeling to understand how the dynamics of the Greenland and Antarctic ice sheets influence current and future sea level. Ben is also an expert in ICESat altimetry and cryospheric science. He has been a member of the science team since 2006. The PSC’s IceBridge Science Team members will be involved in various phases of the project including planning, data analysis and program evaluation. All three will help plan flight routes. The PSC investigators will also evaluate, format and analyze data resulting from IceBridge flights. 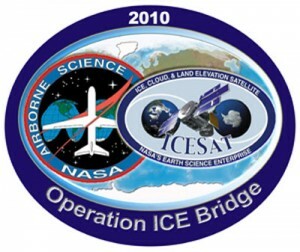 Ben will use older ICESat data and the new IceBridge data in order to capture changes in the ice caps from the beginning of ICESat in 2003 through the conclusion of the IceBridge project. Ian will analyze the thinning data and compare them with measurements of the changing speed of the glaciers, which he has produced using spaceborne radar data from several satellites. All three will also help draft science requirements and evaluate IceBridge’s progress toward these goals. The IceBridge project complements PSC’s mission to “observe and model the physical processes that control the nature and distribution of sea ice and polar ice sheets”. IceBridge data will be available for a number of existing PSC projects in this field. Data can be incorporated into the new Unified Sea Ice Thickness Climate Data Record, a project headed by Ron Lindsay. Data will also be available for other projects evaluating changes in Greenland outlet glaciers and Antarctic ice shelves (http://bigice.apl.washington.edu). IceBridge will acquire data critical for monitoring the current state of the polar ice and for future climate modeling. According to Ron Lindsay “the IceBridge effort provides not only valuable data on the state of the sea ice and ice caps during the interim between the ICESat satellites, but additional new information we cannot obtain from satellites about snow on sea ice and ice caps or bed characteristics under the ice caps”. PSC investigators are uniquely positioned to enhance this important project.